Flea Fogger - Are Flea Bombs Safe? A flea fogger, also called a flea bomb, is basically an aerosol container that contains insecticide. When activated the can sprays the insecticide into the room (kind of like a cloud of poison) where it falls and coats all exposed items. Flea bombs can be somewhat effective, especially if you're facing a serious infestation but do to the fact the chemicals cover everything inside the room, they're not ideal in every situation. Typically, a rental home that is vacant and being cleaned for a new tenant can be an ideal location for a fogger because the house is already empty. While growing up my parents would "bomb" the house when we had plans to be out of town for a couple of days. Although they worked okay, the cleanup afterwards was always labor intensive because we had to wipe down all of the cabinets and countertops, vacuum the furniture and carpet and make sure we didn't miss any spots that contained the insecticide. Flea Fogger - How Well Do They Work? If you're serious about getting rid of fleas inside your house, there are a lot of products and techniques on the market that work better than a fogger. In fact, many users report poor experiences when using them. Since the chemical only settles on the surface of the carpet when it falls, it never gets down deep into the carpet where the flea eggs and larvae are hiding. Without disrupting the fleas lifecycle at all stages, you'll never win the battle against fleas. Also, the chemicals typically don't reach small areas like closets, so you're not treating your whole house which allows the fleas to continually multiply. 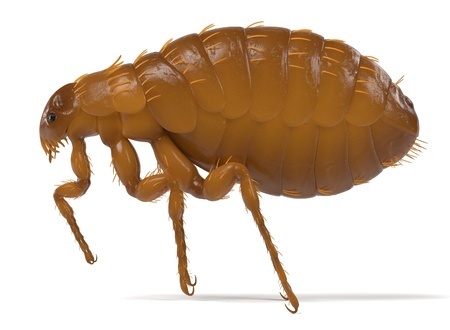 If you're experiencing a problem with fleas inside your house, you'll need to do more than just setting off a fogger and returning a couple hours later to a useable flea free home. Considering the amount of time it takes to prepare your house, the cleanup afterwards and the fact the active ingredients don't penetrate your carpet very well, I don't recommend using a flea fogger to control fleas inside your home. Instead, try frequent vacuuming which is somewhat time consuming, but works really well at killing adult fleas along with eggs and larva. Also natural products such as diatomaceous earth are non poisonous and are very effective at killing fleas and a variety of other pests. Getting rid of unwanted fleas will also require treating your pet and its bedding if you have one. Chances are you have fleas because of an animal and you'll want to treat your pet at the same time to get rid of your problem for good.